April 2019 Photo Contest Winner! Brandon (6 years old) loves baseball! Here's a note from Dexter to Brandon - We waited a long time for this moment but finally got to see you play in your 1st Little League Baseball game! Go A's! Mom and dad are incredibly proud of you! Submitting photos is easy! Send any baseball picture with a letter about how baseball is important to you! Include your e-mail address, mailing address and phone number so we can contact you if your photo is chosen. Winning photos and captions will be added to our photo contest link every month! 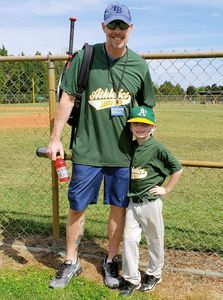 We are looking for photos of baseball coaches, Little League players, babies with baseball stuff, etc. Please do not send pictures by e-mail - they will not be opened! Photos will not be returned!